Lately, I've been fooling around with the figures from the 2009 BP Statistical Review (BSR) -- in particular the data for "Consumption by Fuel". I've made some surprising discoveries which I'd like to share with you. First, a note of caution: The BSR has some problems with completeness. For example, we know from EIA power generation stats that the Philippines produced 8.5 TWh from hydro, and 9.7 TWh from geothermal in 2007. This closes matches the BSR figure for hydro in 2007 (1.9 million tons of oil equivalent (mtoe) = 8.4 TWh). However the BSR only lists power consumption in 5 categories: Oil, Coal, Gas, Nuclear and Hydro. It neglects non-hydro renewables, and this distorts the data for nations which generate considerable power from non-hydro renewables (e.g., the Philippines, Iceland, Sweden, Brazil, Denmark, Canada and Finland). Another issue is that the BSR is not comprehensive, and only provides data for larger nations. In the future, I'll try to calculate a more accurate picture from EIA data, but for now, let's look at the results from the BSR. There are numerous losers in FF dependence. 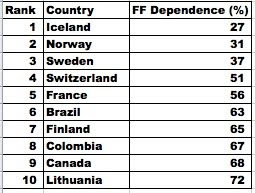 Countries with a FF dependence of 97% or higher are: Singapore, Saudi Arabia, Kuwait, UAE, Turkmenistan, Qatar, Denmark, Belarus, Algeria, Poland, Iran, Netherlands, Bangladesh, Ireland, Thailand, Indonesia, Greece, South Africa, Uzbekistan, Kazakhstan, Malaysia and Australia. The efforts by the Scandinavians is notable, especially since Norway is an oil exporting nation. In Sweden, ending dependence on oil is a goverment policy http://en.wikipedia.org/wiki/Oil_phase-out_in_Sweden. This goes a lot further than any "foreign oil" policy in the US. They go as far as phasing out the ICE completely, with no new sales by the mid 2020s. Not bad for a car loving nation (home to Volvo and SAAB). The Swedish state is a very innovative legislator, and its not uncommon for it's policies to be copied in other European nations. I really hope that this one catches on. Perhaps you could develop the idea of this article further by discussing 'potential stallions'. e.g. Australia will never have as much hydro as Norway or biomass from forests as Sweden, but there is a huge solar resource. I assume there is a "lies, damned lies and statistics" problem here. How do the available numbers account for indirect, or embodied, use of oil and fossil fuels? Is outsourcing energy intensive operations in exchange for low energy intesive operations included? Switzerland, as an example, can be said to be an embodiment of the saying "sell electrons, not atoms." I like this post, but wonder is natural gas is really a "nag." Seems like we are entering an age of perma-gluts for shale gas, and other gas. Cars can run on CNG, you can make cheap methanol from NG. Might be a 100-year run. Not a nag yet. Looks like oil can't be counted out this year! I think Sweden has the right idea: try to phase out as much of the dirty stuff as practicable as quickly as possible. The real problem with fossil fuels is they are too abundant, at least if you include the unconventional resources. Yes Gavin, it's a policy of our government. Government policies have a long track record of miserable failure and about as often as not doing the exact opposite of what it is publically claimed they will do. Just a few years ago our government shut down a perfectly functioning nuclear plant for no other reason than as a concession to the fossil fuel hugging "greens". If our "greens" actually had their way they would get rid of all nuclear power and import natural gas from Russia instead; they've been suggesting this since BEFORE the Soviet Union collapsed. 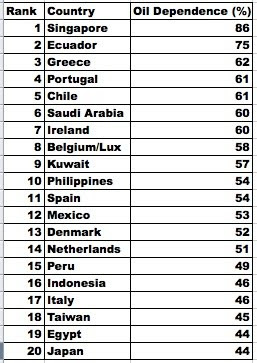 Well I'm glad to see the U.S. isn't on any bottom-20 or bottom-10 lists here (I was afraid it would be), so that's progress. But I am disappointed we aren't a leader in fossil fuel independence. But I'll give it some time and investment and see how things go. That being said, I'm surprised Denmark is such a loser in terms of FF independence. Granted, wind generators don't produce a lot of electrical power, but I thought pioneering off-shore wind underlied a tradition that would lead to more FF independence by now. Hmm. Interesting article on the Oil Drum; agriculture will not cease to function even if oil were to stop completely. The author found hard data to back up what my father used to say, the tractor cost less to operate than the @#&! horses. Maintaining draft horses would take up 1/4 of the farm, and fueling the tractors from on-farm biofuels is less than 10%. And Dad did grow up with draft horses. Despises horses to this day. The nicest thing he ever said about them is that they tasted better than expected. Another interesting article in Scientific American on enhanced oil recovery. We can expect a long tail on the depletion of the oil fields. No sudden stop, so given any sense at all there will be plenty of time to adapt. Readers can draw their own conclusions on the relative efficacies of nuclear versus wind in reducing fossil fuel dependence. Yes Mike S., the agronomically ign'ant peakniks, ethanol-bashers and fossil fuel hugging "greens" (in Soylent's terms) are either stupid or evil when they rant and lie about the costs of farming. Not only the mechanisation costs but the chemical costs can be taken care of on-farm. Corn, the best figgin' grain ever contains MORE than all the minerals needed to grow the next crop as long as we don't let the red-headed stepchildren flush the bones and manure into the Gulf of Mexico. So who wants to move to Uzbekistan? Give it a shot. But know that they have inferior potassium. There's an interesting forecast by the Renault Chief Exec that 1 in 10 cars sold will be electric by 2020. If true, this would certainly put a big dent in oil demand. EIA forecasts of 119 mbd of demand are way too high, IMO. The Swedish oil phase-out is forgotten and buried, and never realy was anything more than hot air to begin with. These figures are confusing: they dramatically contradict ecological footprint data. 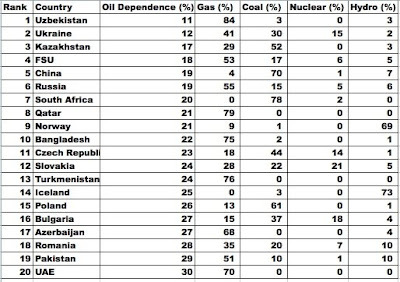 For example, Canada is on the low-fossil-fuel-dependence list (though how we can be, I don't know, since 68% doesn't seem low) - however, Canadians would have to lower their ecological footprints by 70% to be as low-energy use as several of the "bad" countries you have listed from the BP report. In addition, Canada exports an approximately equal amount of fossil fuels to what it imports. For statistics kept by oil companies, this would represent an extremely low fossil fuel use, relatively. But we are very high fossil-fuel users. As responisble (partly) for the Icelandic energy statistics, it seems obvious that our other renewable sources (geothermal) are included into the Hydro. So it seems that all renewables are just branded hydro, and thus nothing is missing (only wrongly categorised.). The entire premise is bogus. Fossil fuels are plentiful, and their use and CO2 emissions are both beneficial. So "progress" in eliminating them is actually regression, deliberate economic self-mutilation.